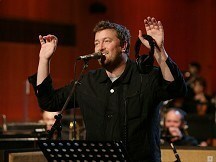 Elbow are to play another date at a major church after lining up a show at Manchester Cathedral. The band - whose tracks include An Audience With The Pope - will play the venue for a live broadcast on BBC Radio 2. It follows a show earlier this year in the crypt of St Paul's Cathedral in London. The five-piece act, who hail from Bury and are led by BBC 6 Music presenter Guy Garvey, will perform tracks from their Mercury Prize-nominated album Build A Rocket Boys! as well as other well-known tracks. The show on October 6 will be broadcast in Radio 2's weekly In Concert series and will feature the Halle Youth Choir which featured on the band's fifth album. Jeff Smith, Radio 2's head of music, said: "I'm delighted to continue our 'homecoming' series with Elbow. They are a magnificent live band and I can't wait to hear how the cathedral setting lends itself to their stirring and anthemic music." Fans can watch the performance via the BBC Red Button and on the Radio 2 website, bbc.co.uk/radio2. Mark Ronson has created a catchy beat-driven track based on the sounds made by top athletes as an anthem for London 2012. Noisettes' singer Shingai Shoniwa says voicing the role of a children's TV character has made her more creative. Lady Gaga says a Nevada-based company is trying to cash in on her fame to market cosmetics and jewellery. Fearne Cotton will team up with Oscar-winner Jamie Foxx to co-host next month's Michael Jackson tribute concert. Katy Perry enjoyed some local fare then danced it off with the Tango before taking to the stage in Argentina. Stereophonics frontman Kelly Jones has revealed he "keeps the tap dripping" to avoid getting writer's block.